Upon consideration en banc, a majority of the court affirms the district court’s holding that the asserted method and computer-readable media claims are not directed to eligible subject matter under 35 U.S.C. § 101. An equally divided court affirms the district court’s holding that the asserted system claims are not directed to eligible subject matter under that statute. The court was sharply divided across six separate opinions. There was agreement that the test for eligibility is not a rigid, bright line test and must be made by evaluating a claim as a whole, on a case-by-case basis, using a flexible approach. Many of the judges explicitly noted that the test for eligibility is a separate and distinct inquiry from other patentability concerns, particularly novelty and obviousness. It was generally agreed that when evaluating the claim as a whole the claim must be analyzed to determine whether the additional limitations add significantly more, or in other words add meaningful limits, to the abstract idea or law of nature. The memo concludes by stating that the USPTO will continue to study the decision in CLS Bank and will consider whether further detailed guidance is needed on patent subject matter eligibility under 35 USC 101. Software patents claims through system claims should still be patentable under the CLS Bank decision because the court was equally divided. An equally divided court provides no majority position with respect to the system claims at issue. A recently published application shows IBM seeking a patent on a client-side search indexing program that works in conjunction with a server based search index to provide a users with personalized search results. Search result personalization is a long sought after goal. Google personalized search attempts to provided user customized results by retaining user data on the server-side. However, others have sought client side solutions. Jaime Teevan, et al.’s article “Personalizing Search via Automated Analysis of Interests and Activities” demonstrates that personalized client-side algorithms can significantly improve on current Web search results. Demand for improved search methods will increase with the ever expanding amounts of data. 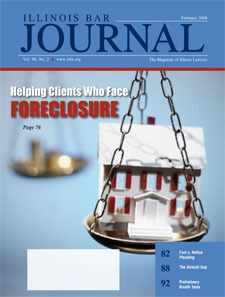 The February issue of the Illinois Bar Journal carries my article on “How to Admit or Exclude PBT Results” [Subscription Req.] . PBTs are preliminary breath tests that are typically administered by the police on the scene of a traffic stop. The police use the results of a PBT as a factor to help establish probable cause to arrest a driver for driving under the influence of alcohol. PBTs are different and less reliable than the breath tests typically given at the police station—a.k.a. chemical tests—and therefore PBT results are treated differently than chemical test results. The article explains (1) when PBT results are admissible in court, (2) when the State is required to lay a foundation for their admission, and (3) what constitutes an adequate foundation. This article arose out of my work as a staff attorney at the Eighteenth Judicial Circuit Court of Illinois. However, the views express in the article are mine and not necessarily those of the Eighteenth Circuit. Eric R. Waltmire, How to Admit or Exclude PBT Results, 96 Ill.B.J. 92 (2008). Guy Kawasaki pointed me to this video of Chris Anderson talking about the topic of his next book–"the emerging world of free." His discussion of 3D printing technology got me thinking about how it might create a new class of inventors and innovation. 3D Printing in the World of Free. At 14:57 in the video, Chris states that 3D printing technology is introducing aspects of free into the world of physical products. He says 3D printing makes complexity free. Traditionally every bit of complexity in an item added more cost. However, every additional level of detail and complexity–i.e. grove in the surface–in a 3D printed item is free. The additional complexity cost nothing; the 3D printer head just takes a different path to make the detail required. Chris says this ability to make physical complexity for free will dawn an "erra of impossibly detailed and fantastically complex products, which never would have made sense in the traditional manufacturing environment, but are now happening because the cost is now zero." Chris also touched on 3D printing in his first book, The Long Tail (see page 225). Idea Lab is on the verge of releasing its Desktop Factory 3D Printer for $5000. At that price its targeted businesses and schools. A 5000 price seems a little steep for the mass market. But of course prices will come down. 3D Printing and Inventors. The Wall Street Journal has an article [no subscription required] discussing how companies are forming that use 3D printers to allow users to print 3D figures from online games. You create the figure and the company will print it and mail it to you. The article has this video that explains the state of the art of 3D printing. The video explains that the technology is not perfect, and the products created by a 3D printer may not be as refined and durable as desired. However, in the future it will be possible to create something of a computer or buy a product online, download instructions, and "print" the product right in your home. The video shows how a working flashlight can be printed using current technology. 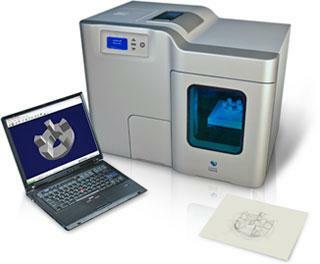 Certain 3D printers have the ability to print electronic components as well. The pace of innovation and iterative invention will quicken when inventions or components of inventions can be quickly and cheaply printed and tested. So, will inventors purchase affordable 3D printers to prototype their inventions? I think so. As the price of 3D printers drop, the ability to easily create will increase the number of inventors and correspondingly the amount of innovation. Just as the web 2.0 has drawn many more to be participatory content creators, will 3D printers draw the masses to invention and create a new mass/class of inventors? When are Internet Communications not Electronic Communications? 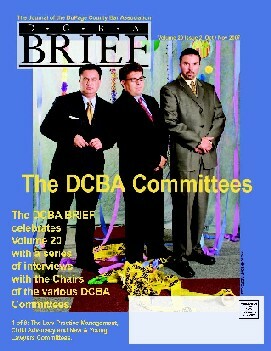 I was the lead article editor for the November 2007 issue of The Brief [pdf, 5.6Mb], the DuPage County Bar Association�s legal journal. Do not be fooled by the gangster-like poses on the cover; the issue is packed with excellent content. As a lead issue editor I was responsable for obtaining and editing the content, specifically the lead articles for this issue. I want to thank all the contributors that made bringing this issue together a smooth operation. You can find my lead article�s editor introduction on page 1. Also on page 32, you�ll find my article titled, “When are Internet Communications not �Electronic Communications� under the Illinois Eavesdropping Statute?”1 The article challenges the proposition presented in a May 2004 Illinois Bar Journal article,2 which indicated a law enforcement official�s act of saving a copy of an internet chat conversation might constitute eavesdropping if done without a warrant. The analysis turns on the definition of “electronic communications” under the eavesdropping statute. An internet chat conversation is generally understood to be an electronic communication, however it is not an electronic communication in this senario according to the definition in the eavesdropping statute. 1.Eric R. Waltmire, When are Internet Communications not “Electronic Communications” under the Illinois Eavesdropping Statute? 20 The Brief, Nov. 2007, at 32. 2 Helen Gunnarsson, No Police �Eavesdropping� on Sexual Predators � Even in Cyberspace? 92 ILL.B.J. 238 (2004). The New York Times reports that Jon Dudas, director of the United States Patent and Trademark Office, wants changes in the patent law that would require the applicants to conduct a thorough search of prior art, and provide a explanation why the patent being sought represents a significant innovation in the field. Elected Officials: Ask Us for Solutions. Reddit reports that the President of India, Dr. APJ Abdul Kalam, posts a question on Yahoo Answers. Yahoo states that this is really from the President of India. He also has a Yahoo 360 page. Human society, from origin until now, has always been at war within and between groups and has led to two World Wars. Presently, terrorism and low intensity warfare are affecting many parts if the world. As the current global population of 6 billion increases to 8 billion by 2025, national and international conflicts will continue to be a source of concern for humanity. When evil minds combine, good minds have to work together and combat. In this context, what are the out-of-the-box solutions to free the planet earth from terrorism? Your answers when processed and implemented can lead to a peaceful, happy and safe planet earth. When is the last time your elected official asked you for your ideas on solving problems in United States or the World?